I'm back with another duo, this time for Valentine's Day. This won't be the last you hear about Noodles Nail Polish this week, because I still have the 6-piece Winter 2019 Collection to show you. 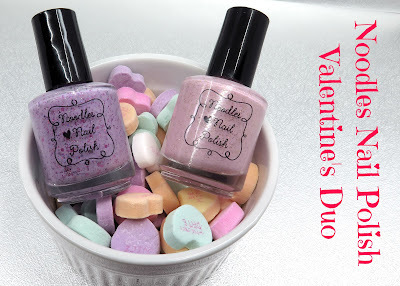 This Valentine's Day duo will be debuting this Friday, February 1st at 6 PM ET in the brand new Noodles Nail Polish website. Natalie is well-known for her glitter crellies, and it just so happens that both of these are beautiful crellies. These will retail for $9.50 each, and will be sold individually. If they happen to sell out, they will be restocked. Shall we get a closer look? Up first we have Daydreamer which is a pale pink crelly base with gold flakes, glitter, and shimmer. This is a soft shade, and I love pink and gold together. Since this one is more pastel-like, it was slightly streaky on the first coat, but built up well with the second. I went ahead with a third just to make sure everything was covered (bright lighting tends to show everything), but you'd be just fine with 2. It dries with a little texture from the glitter, so make sure to use a thicker topcoat to smooth everything out. It also dries with more of a satin finish from the pigment, so topcoat will help with that, too. Once Upon a Time is a lavender crelly base with magenta, violet, and fuchsia hexagonal glitters, and fine silver flakes. This is Natalie in a bottle. If you've tried glitter crellies from other brands that were thick and hard to apply, please do yourself a favor and try one from Noodles. I think I'll wear this on my Valentine's date to IHOP (don't ask...yes, our tradition is to eat at IHOP on Valentine's Day). This is 2 easy coats, and it dries with some texture from the glitters. I often get asked what peel-off basecoat I use, and I use the UNT Ready for Take Off. Removal of glitter polishes is easy-peasy. Noodles ships extremely fast, so you shouldn't have a problem with getting them in time (as long as you're in the US, of course). I honestly don't have a favorite of the 2. Both of these are quintessential Valentine's Day shades, with a Noodles twist. Again, make sure to check them out this Friday at 6 PM. You can find out more about Noodles Nail Polish on their website, Instagram page, Facebook page, and Facebook Fan Group.